“Once again, working with the HJ Sims team provided the absolute best solution to meet our senior living expansion pre-development financing requirements, and unforeseen financing challenges along the way. We required skillful financial advisors with years of senior living experience in evaluating our current debt structure, and future financings for our expansion construction project. HJ Sims was consistent in providing valuable insight, and several financing scenarios to executive management and our Board. Thanks to HJ Sims, our pre-development financing was obtained with SunTrust Bank. Federation CCRC Operations Corp. (d/b/a Toby and Leon Cooperman Sinai Residences of Boca Raton) is located on the campus of The Jewish Federation of South Palm Beach County in Florida. Sinai Residences currently operates approximately 234 independent living units, 48 assisted living units, 24 memory-support units, and 60 skilled nursing beds. Upon opening in January 2016, the independent living units achieved stabilized occupancy in nine months and has enjoyed occupancy of its independent living units in the mid to high 90th percentile since opening. Offerings of assisted living, memory support and skilled nursing have also maintained satisfactory occupancy historically. The Board of Sinai Residences determined to undergo an expansion to add approximately 111 independent living units to the community. With its strong cash position, Sinai Residences had the ability to cover pre-development expenses with its own unrestricted funds but sought to finance certain pre-development expenses in lieu of liquidating investments. Identifying a partner that may participate in the expansion project once fully under way. HJ Sims coordinated a bank request for proposals process that was widely distributed to prospective commercial lending institutions and facilitated site visits for prospective lending institutions resulting in a number of attractive proposals. HJ Sims assisted the Sinai Residences navigating through development and financing challenges, ultimately coordinating the financing process with the selected lender, SunTrust Bank, and their legal teams to drive the transaction to closing on March 15, 2019. Sinai Residences was able to obtain an $8.1 million pre-development loan without a requirement for an appraisal and with a two-year maturity, providing sufficient time to complete the pre-development process and reach full financing of Phase II. 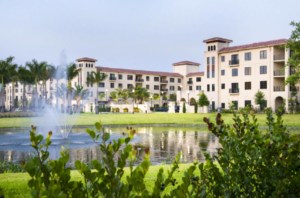 Toby and Leon Cooperman Sinai Residences of Boca Raton is an existing life plan community, which consists of approximately 234 independent living units, 48 assisted living units, 24 memory-support units, 60 skilled nursing beds and related common amenities. Sinai Residences is located in Boca Raton, Florida in South Palm Beach County. Sinai Residences opened in January 2016 and achieved stabilized occupancy of its independent living units in just nine months’ time, of its skilled nursing units in 11 months, of its assisted living units in ten months and of its memory care units in six months. All entrance fee debt associated with the initial development of Sinai Residences was repaid nearly two years prior to the expected final repayment of such indebtedness. Given the strong demand for its existing independent living offerings, Sinai Residences sought to expand the community through the development of approximately 111 additional independent living units. Thus, the team at Sinai Residences turned to HJ Sims, its partner during its original pre-development and start-up financing, to facilitate a bank request for proposals process to find a suitable commercial lending partner for an $8.1 million pre-development loan. That process generated significant interest in the community and resulted in a number of attractive proposals for interim bank financing. Before the financing could close, the development team was required to reconfigure the development plan for the additional independent living units, delaying the initial planned closing date. Furthermore, lower-than-expected attrition combined with higher-than-expected operating expenses for Fiscal Year 2018 resulting in a 1.0x Debt Service Coverage Ratio for that year. HJ Sims coordinated closely with Sinai and its ultimate chosen lending partner, SunTrust Bank, to facilitate the closing of the $8.1 million pre-development loan in light of the near-term challenges facing the project. On March 15, 2019, just over a month after receipt of the indicative term sheet, HJ Sims facilitated the closing of the $8,100,000 pre-development loan, which was structured as a two-year draw down commitment (the “Series 2019 Loan”). The Series 2019 Loan was provided by SunTrust Bank and its Aging Services/Senior Living Industry Practice Group. SunTrust’s experience in financing entrance fee continuing care retirement communities and HJ Sims’ experience in facilitating and underwriting such transactions together created an environment in which a one-time operating challenge and revision to the development plan did not adversely impact the terms or covenants by which the Series 2019 Loan was made available to Sinai Residences. This paved the way for the smooth continuation of the pre-development process as Sinai Residences moves towards the full Phase II expansion. For more information on how Sinai Residences was Financed Right® by HJ Sims, please contact Aaron Rulnick at arulnick@nullhjsims.com or (301) 424-9135, Melissa Messina at (203) 418-9015 or mmessina@nullhjsims.com, or Patrick Mallen at (203) 418-9009 or pmallen@nullhjsims.com.